Donkey Kong Classics is a compilation that contains both the original Donkey Kong game, as well as the sequel Donkey Kong Jr. 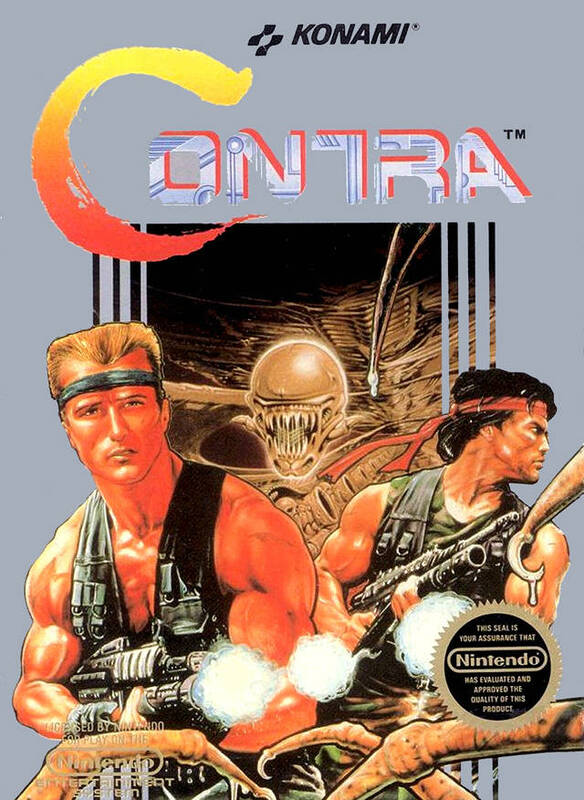 Despite having both games on the cartridge, it still only requires maybe 10 minutes to play through as both games are exceptionally short. Donkey Kong contains a whopping 3 levels, and Donkey Kong Jr contains an additional 4 levels. Each level encompasses a single screen from a side-view and requires you to make your way from the bottom left starting area up to the top. In Donkey Kong, you play as Jumpman (the original Mario) and have to rescue your girlfriend Pauline from the big ape. Apparently he's climbed to the top of a building, so you go through 3 levels working your way up. In the first level, you have to climb a series of ladders up some angled platforms while dodging barrels that Donkey Kong is rolling your direction. Stage 2 has smaller platforms, more ladders and a couple of elevators to work your way up. Instead of throwing barrels, you now have to avoid some type of bouncing objects that the ape throws at you. These are mostly easy as they all move exactly the same. There are also a couple of fireballs that move about, climbing up and down ladders that you have to avoid touching. In the last level, you have 4 large platforms with 2 yellow rivets on each one. Jumping over the rivets removes them, and when they're all gone Donkey Kong falls to the ground and lands on his head, you save your girlfriend and then... you start over back on the first level and do it all over again. In Donkey Kong Jr you play as, well, Donkey Kong Jr. Your job is to rescue your father, Donkey Kong, from the evil villain Mario who has him trapped in a cage at the top of the screen. In the first level you climb across the screen on vines and work your way up to the top while avoiding little alligator looking enemies that Mario sends towards you. The second level has a spring board on the bottom to launch you onto a moving platform, and a bunch of chains instead of vines. The alligator enemies have been replaced by birds that will occasionally drop eggs on you. Third level is some type of electric level that makes very little sense. There's just a few platforms made of electricity, and little red and blue sparks move around them and you have to avoid the sparks as you climb to the top. It's really easy, but doesn't seem to fit in with the rest of the game. The final level just has 8 chains hanging from the top of the screen, and 6 of them have keys on them. You just push those 6 keys up into the holes at the top of the screen, then Mario and Donkey Kong come crashing down. You catch the ape, and let Mario hit the ground and die. After this... you start over back on the first level and do it all over again. There are single player and 2 player modes, each with 2 difficulty modes. Mode A is easy, while mode B is slightly more difficult. In 2 player mode, the first player will play until he dies and then the second player will start his turn. It doesn't matter if you beat a level, or even beat the whole game - you keep playing until you die. The main competition, other than completing the game, is to see how many points you can get. You get points for jumping over enemies, killing them with the limited duration hammer power-up (Donkey Kong), dropping fruit on the enemies (Donkey Kong Jr), as well as bonus points for finishing the level as quickly as possible. Since you can continue to play over and over again after you finish the game, racking up your score as high as possible would be the ultimate goal of the games. The graphics are simplistic, but these games are ports from arcade games made in 1981 and 1982. Keep in mind, the original Super Mario Brothers game wasn't released until 1985. The game actually doesn't look that bad; the characters are easily recognizable, there are some basic character and enemy animations and a (limited) variety of game levels. I think they would have been better off to update the graphics before sticking the game on a Nintendo cartridge, especially since neither game made it to North America until 1986 when there were much better looking games available. The sounds are hit and miss. The sound of Mario's footsteps and Donkey Kong Jr's climbing sounds are a little too high pitched and repetitive, and they really annoy me. On the other hand, some of the synthesized background music really good and pretty memorable. That strange level 3 in Donkey Kong Jr has some faster blips and beeps that fit the level design so nicely, even though the level itself seems out of place it's one of my favorites. Overall this is an average game, but it's certainly a classic that has helped lead the way for future platformer games. Pick it up for a buck or two if you can find it, otherwise pass because the length and replay value of the game don't make it worth much more than that other than as a collector's item. 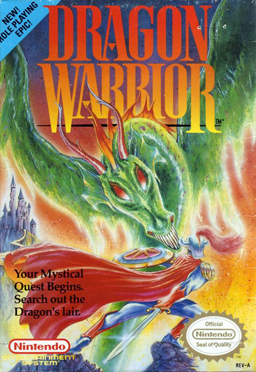 Dragon Warrior is a game that is very near and dear to my heart; it was one of the first RPGs I cut my teeth on, along side The Legend of Zelda, Final Fantasy and Ultima: Exodus. When we got our first Nintendo when I was young, we only had a few games for it, so those games ended up being played so often and engraved into my brain that I'll never forget them. Dragon Warrior being all the more fun because it came totally free with our subscription to Nintendo Power magazine. Now that I'm older and have started collecting vintage Nintendo games, I have a much larger collection - but I still love to take out a few from my childhood and replay them for the nostalgic value. Often I'll start up a game and instantly remember every single thing about it, and this was the case with Dragon Warrior as well. Dragon Warrior (known as Dragon Quest in Japan) is a role playing game that was developed by Chunsoft and published by Enix in 1986, though it didn't make it to North America until 1989. It's features a pretty standard story these days, where you're a stranger who comes to the kingdom of Alefgard and is tasked with saving it's princess and defeating the evil Dragonlord and recovering the Balls of Light he has stolen. Along the way you fight monsters like slimes, magicians, knights and dragons in random encounters on the world map, gaining experience and gold as you go. You actually rescue the princess fairly early in the game, and technically you can even skip rescuing her all together. When you finish the game, she'll be back at home in the castle anyway. If you do rescue her though, she gives you her "love" as an item that you can use to tell you how much experience you need to level up, as well as give you your coordinates on the world map. This is helpful for finding one of the items necessary to complete the game, so unless you're using a walkthrough or have beaten the game previously it's probably best to go ahead and save her. The world map is setup in a tile-based overhead view, and your single character can walk around in four directions. Enemies all have fixed stats and do not gain in strength as you do. The map is pretty open, allowing you to travel almost anywhere you want - but if you try to go to an area that's too difficult the enemies will make mincemeat out of you. Crossing bridges across rivers signify major changes in enemy difficulty though, so at least you have some sort of warning that the difficulty is going to increase as you travel. There are a number of different enemies in Dragon Warrior, but many of them are just palette swaps (the same graphic as another enemy, but colored differently). For example, the slime, red slime and metal slime; or the drakee, drakeema and magidrakee. Departing from the overhead view of the rest of the game, the enemy appears facing you in a box that takes up the middle of your screen. Enemies only appear one at a time, and you fight them in a turn-based fashion using a small menu consisting of Fight, Spell, Run and Item commands. There are only a small number of different weapons and armors that you can equip, but on the other hand this means that each new piece is a noticeable upgrade. You can also obtain a limited number of items such as torches, medicinal herbs, magical wings to transport you back to the starting castle, etc. There aren't that many items, but it's almost a good thing because you have very limited inventory space in Dragon Warrior. You will often find yourself throwing away herbs or torches or something that you wanted to keep because you need the room for other things. You also start off not knowing any magic, and gain a new spell every few levels, for a grand total of 10 spells. These spells allow you to heal yourself, exit a cave, return to town, light up a cave, keep weak enemies away for a brief time, hurt an enemy, put them to sleep or stop them from using magic. One thing that always annoyed me about Dragon Warrior was the user interface. It's not exactly bad, but it's totally menu driven, with lots of sub-menus to get anything done. Especially climbing up and down stairs... instead of just walking onto the stairs, you also must hit a button to bring up the menu and then select "Stairs" from the menu. The same holds true for talking to people, opening doors or treasure chests, searching the area... The other annoyance is the fact that dungeons are all mazes that are pitch black. Using a torch illuminates one square around you until you leave, while the Radiant spell illuminates 3 squares around you and then reverts to 2 squares after a while, then down to 1 square and finally disappears entirely. A torch often isn't enough to help figure out the maze-like dungeons, and you don't even learn the Radiant spell until level 9. This makes early dungeons really annoying to traverse. Later ones aren't that much better, because they're usually longer and filled with thougher enemies, so you want to save your limited magic points for healing or battle spells. You have 3 "Adventure Logs" that allow players to pick a name and a message display speed for 3 different games on the cartridge. When we first got the game I wasn't the only family member playing it, so it was nice that 3 of us could all play our own games (one at a time). You can save your game by talking to the king and recording your journey in the "Imperial Scrolls of Honor", and it saves to the cartridge's battery backed RAM so there are no long annoying code strings to input to continue. If you die, you're transported back to the king, so it's often useful to suicide on purpose rather than walk all the way back if you don't have any magical transport wing items. The vibrant and colorful artwork in Dragon Warrior was drawn by Akira Toriyama. Some may quickly recognize him as the creator of Dragon Ball, one of my favorite manga and anime series of all time. Characters in the game are drawn in the same style as Final Fantasy or The Legend of Zelda, where they have short bodies and big heads. This makes it easier to add details to the head where they'd be more recognizable than on the body, and also makes the characters look more cute and fun. The character style meshes well with the bold and colorful tiles that make up the world, making the whole game look charming and appealing. The music in Dragon Warrior was composed by Koichi Sugiyama, who is well known for his composition of Japanese television shows. It's beautiful and melodic, and some of my favorite music from the Nintendo era. The soundtrack features eight classic sounding pieces, including the introduction, castle, town, world map, cave/dungeon, battle, final boss music and the ending track. The world map music is free and airy, giving you a sense of freedom as you explore. This is contrasted harshly by the dire battle music when you engage in a random encounter with enemies. The music for the final dungeon is ominous and foreboding - you know you're getting near the end when you walk into Charlock castle by the music alone. I'd recommend that everyone should play Dragon Warrior at least once. If you have a working Nintendo, the game can be found for about $5 online. 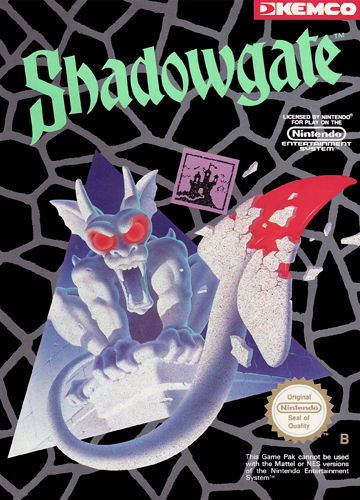 It has also been remade (along with Dragon Warrior II) for the Super Nintendo and the Gameboy Color in a 2-game cartridge if you can play it that way. It's truly a fun game, though it offers little replay value. Once you've beaten it, you pretty much know everything there is to know about it. 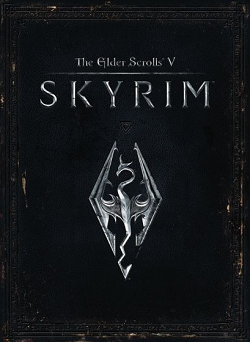 I still play it every couple of years for the nostalgic value, but I can breeze through it in a day now. "Congratulations! Thou hast restored peace unto the world! But there are many roads yet to travel. May the light shine upon thee." Duck Tales was a cartoon series produced by Walt Disney Television Animation that aired between 1987 and 1990. 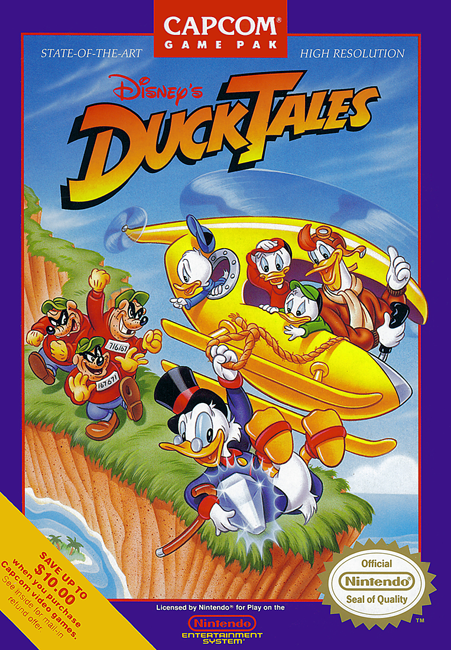 In 1989 Capcom developed and published this video game version of Duck Tales for the Nintendo Entertainment System. Duck Tales is a side-scrolling platform game that is similar to Mega Man in a number of ways, being created by the same company. Many of the characters from the cartoon make appearances in the game, including Huey, Dewey and Louie, Mrs. Beakley and Webby, Launchpad and Gizmo Duck. Usually they are just brief appearances to offer a hint, drop some food or blow up a wall blocking your path. Some of the cartoon's main antagonists also appear, including The Beagle Boys, Flintheart Glomgold and Magica De Spell. Like Mega Man, players will move about the screens from left to right eliminating enemies, climbing up and down vines and ropes, jumping over pits and collecting items. Unlike Mega Man, Scrooge doesn't equip various weapons to complete his task. This duck's old, but he's not helpless - he jumps around on his cane like a pogo stick and eliminates enemies by bouncing on their heads Mario style. There are five different areas of the game, these include the African Mines, Amazon, Himalayas, Moon and Transylvania. Each one can be selected from the main screen and completed in any order for the most part. There are exceptions, like if you enter the mine one of Scrooge's nephews tells you that you need the key to enter the mine, and the key is in Transylvania - and then you are teleported to Translyvania. The goal is to recover a piece of treasure from each area, and every area is distinct and plays a little differently from the others. One is full of mirrors that you touch to warp you around the level, another has vines to climb, and another has snow that keeps you from bouncing along the ground on your cane. Duck Tales is a fairly easy game, and also fairly short once you figure out where to go in each level. There are three difficulty settings; easy, normal and difficult, which does help to add some challenge to the game. Still, you can breeze through it on hard in 10 or 15 minutes after you know where to go and what to do. Scrooge has 3 little orbs of health, and he looses one each time he takes damage. These can be replenished by collecting little ice cream cones from killing enemies or from treasure chests. You also collect various sizes of diamonds to add to your score. If you collect enough money and find the 2 additional hidden treasures, the game rewards you with a slightly alternate ending. The graphics are vivid and colorful, characters easily recognizable and everything is smooth and polished for a game of this age. It's really very similar to the first Mega Man game, and that's a compliment folks. There are a variety of different enemies from little grey robots and white reindeer to gorillas and bees. The bees fly, deer jump fairly high and bounce around the ground - most every enemy is unique. The music is also mostly above average and fitting. Each level has a different piece of background music that really adds to the ambiance - in Transylvania the music is dark and mysterious, on the moon it's upbeat and futuristic. The theme song from the cartoon also plays during the title screen in 8-bit synthesized glory, and it sounds terrific. Overall, I'd say Duck Tales is one of my favorite Nintendo games. To this day, every time I plug it in and start playing it reminds me of sitting at my grandma's house playing it for hours with my cousin. It's also one of the few games based on a television show that's actually worth playing, and a must-have for anyone who still has a working Nintendo. I remember when I was a little kid and my best friend got a Nintendo Entertainment System. Before then, my experience with video games consisted of playing Burger Time on the Intellivision II and Combat on an old Atari 2600. I remember sitting there and playing the Super Mario Bros pack-in game for hours and marveling at how much video games had changed with this new Nintendo console. Since then, I've made sure to pick up every Nintendo home game console released in North America. I have loads of Nintendo and Super Nintendo games that I still enjoy playing to this day. We even had a Virtual Boy, but that came from a flea market or a yard sale or something for only a few dollars and the only game we had for it was Mario's Tennis. While I've got a Gameboy and a Gameboy Advance, I never bothered picking up a Nintendo DS yet (I'll crawl out from under my rock soon, I promise). I didn't care as much for the Nintendo 64. While I collected a small number of games for the system, and it had a few good ones such as Super Mario 64, Ocarina of Time and Super Smash Bros, I found the overall selection much less to my liking than the offerings on Sony's PlayStation. The same thing happened with the GameCube... I collected a few good games such as Zelda Wind Waker, Metroid Prime and Super Smash Bros Melee. Once again Sony's PlayStation 2 featured more games I was interested in, so my GameCube collection is somewhat lacking. I'll get to the Wii games in a bit. The Wii weighs in at 2.7 pounds (1.2 kg) and measures 1.73 inches (44mm) tall, 6.18 inches (157mm) wide and 8.49 inches (215.4mm) deep when placed horizontally. This makes the Wii smaller than Microsoft's Xbox 360, Sony's PS3, and all previous Nintendo home consoles. Mine is black, but it's also been released in red and white, with a blue edition forthcoming. It uses 18 watts of power when turned on, 1.3 watts in standby mode, and 9.6 watts in standby with the WiiConnect24 feature enabled. It uses 12cm Wii Optical Discs, and is backward-compatible with the 8cm Nintendo GameCube Game Discs from it's predecessor. Unfortunately, the Wii is unable to play DVDs, let alone Blue Ray discs. It uses an IBM "Broadway" processor, about which few official details have been released. The processor is (unofficially) reported to be clocked at 729 MHz, but that's totally unconfirmed by Nintendo or IBM. It is obvious, however, that the computing power of the Wii is not even in the same league as the Xbox 360 and it's 3.2 GHz PowerPC Tri-Core Xenon processor or the 3.2 GHz Cell Broadband Engine of the PS3. The same hold true for the graphics processing unit, ATI's "Hollywood" chip. It, too, is unconfirmed but reportedly clocked at 243 MHz and is no comparison for the Xenos GPU in the 360 or the "Reality Synthesizer" GPU in the PS3. The Wii features 88 MB of main system memory and 3MB of GPU frame-buffer and texture memory. It has 512MB of NAND flash memory built in for storage and game saves, which can be extended up to 32 GB with SD or SDHC memory cards. It requires a separate GameCube memory card for GameCube games however. In addition to it's dual GameCube memory card slots, it also features 4 GameCube controller ports behind a semi-hidden panel on the left of the device (on the top if using the vertical stand) to enable connection of GameCube controllers or peripheral devices. While there are various controller options for the Wii, GameCube games are unable to be played without an actual GameCube controller. There are 2 USB 2.0 ports on the back of the machine, along with an air vent, a port for the sensor bar, and the AV Multi Out port. The AV port allows video to be output as composite (cable included), component, or S-Video, at a maximum resolution of 480p. It has built in 802.11b/g wireless internet support through a Mitsumi DWM-W004 module, and is optionally compatible with a USB to Ethernet adapter. The sensor bar is an 8 inch (20cm) long bar that can be setup either above or below your television and allows the Remote to work with all sorts of different televisions and other displays. The cord is 11 foot 7 inches (353mm) long, allowing ample room to position it where you need it to be. My black Nintendo Wii came with Wii Sports and Wii Sports Resort, a single controller, nunchuck and a Wii Motion Plus accessory. The newer black Wii bundle comes with Mario Kart and a Wii Wheel instead of the Wii Sports games, and it includes a Wii Remote Plus. This is simply a standard Wii Remote with the Wii Motion Plus built in to save the 1.5 inch bulk that would otherwise be added by the accessory, and allow you to plug in the Wii Wheel accessory without having to first remove the Wii Motion Plus. The Wii Remote, unlike traditional controllers, is held in one hand like a television remote control. The standard Wii Remote from Nintendo is 5.83 inches (148mm) long, 1.43 inches (36.2mm) wide and 1.21 inches (30.8m) tall. It features a power button at the top, a directional pad underneath and a big A button below that. Central to the remote face is a home button, with a Minus and Plus button to the left and the right of it respectively. Below that is a speaker, followed by the "1" and "2" buttons and then a series of 4 LEDs to indicate which player the remote is set up for. There is a "B" trigger button on the bottom within reach of your index finger. Removing the battery cover from the bottom leaves you with room to install 2 "AA" batteries (included! ), and uncovers a red synchronization button to sync the Wii Remote to the console. There is a small cutout below the battery cover to attach the wrist strap to the Wii Remote, and at the very bottom of the remote there is an external extension connector to connect accessories like the nunchuck or the Wii Classic Controller. There's a silicone rubber jacket that slides over the remote to provide a minimal cushion in case it's dropped. It's also supposed to help grip the remote, but it's such a pain if you use the Wii a lot and have to replace batteries on a daily basis. Not that it's hard to remove, but you have to remove any accessories plugged in, pull the wrist strap through the slot in the back, pull the jacket off... if you have the Wii Motion Plus installed it's even more annoying, and I just haven't felt the need to bother with the jacket because of these things. The remote has an optical sensor that tracks light from the sensor bar to figure out where it's pointing. This, combined with the accelerometer, provides the unique control system of the Wii. Some type of simple speaker is integrated into the remote, as well as a rumble ability. There's also a tiny little memory chip in the remote that allows you to store your Mii avatar to, for example, bring it to a friend's house and use your Mii on his Wii. The Wii Menu is a grid of "channels" that allow you to do different things. The Disc Channel lets you load game discs, the Mii Channel lets you create a custom "Mii" avatar for use with some games, etc. There are channels available for many things, from browsing the internet with the Opera 9 web browser, to playing videos on Netflix to checking your local weather forecast. The Wii has some spectacular games that are exclusive to the system. Monster Hunter Tri, Epic Mickey, Animal Crossing: City Folk, and Donkey Kong Country Returns to name a few. Combined with the usual Nintendo staples like New Super Mario Bros Wii, Super Smash Bros Brawl, Super Mario Galaxy and it's sequel, you've got some pretty substantial reasons to want a Wii. For the PS3 we have a few games such as the Uncharted series, Infamous 2 and God of War 3. While they're all great titles, both the number and variety of quality exclusive titles is still lacking. Microsoft's Xbox 360 has some terrific exclusive titles like Halo: Reach, Gears of War 3, Fable 2, Saints Row and Project Gotham Racing. Much better variety of quality titles than the PS3, and a few more of them as well, I'd say the 360 is about on even footing with the Wii here. Unfortunately, a vast majority of the outstanding non-exclusive titles are available for both the 360 and the PS3, but not the Wii. Final Fantasy XIII, Mass Effect 2, Fallout: New Vegas, Dragon Age: Origins... You'll see them on both of the other systems, and most of them on the PC as well. The Wii is more suited to the casual gamer. They have gobs and gobs of casual games and party games. Standard party games are well represented like Wii Party, Mario Party 8 and Guilty Party, and then you have hybrids like Dokapon Kingdom that try to add some variety. Even the regular games like Mario Kart Wii, Super Smash Bros Brawl and New Super Mario Bros Wii are going to be a lot of fun with a group of people. There's a number of good RPGs such as Xenoblade Chronicles, Arc Rise Fantasia, Fragile Dreams: Farewell Ruins of the Moon, Fire Emblem: Radiant Dawn, Tales of Symphonia: Dawn of the New World, Rune Factory: Frontier and The Legend of Zelda: Twilight Princess. Sports games are also well represented, but the vast majority are smaller dumbed-down games of bowling, golf, tennis or similar. There are some notable major sports titles though, including Madden 12, NBA 2k12, MLB 2k11, and Tiger Woods PGA Tour 12. Some of these may be the same across platforms, some may have totally different controls or inferior graphics on the Wii, while others yet may require additional peripherals such as the PlayStation Move or the Microsoft Kinect to be purchased in order for them to function on the 360 or PS3. Positives and negatives here. The Wii does have many classic games available through their Virtual Console, a separate part of the Wii Shop Channel. These can be purchased with "Wii Points"", which cost around $10 per 1000 points. The games cost anywhere from a few hundred points each to over 1000, so expect to pay between $5 and $15 per game. There are many games from the Nintendo, Super Nintendo, Nintendo 64, Sega Genesis, etc. It's a little expensive for my taste, but there's a few games I want to play that I haven't located or picked up yet for some of those old systems, so I may get a few one of these days. Overall the Wii is a great system, but it suffers greatly from the giant flood of terrible casual game collections. If 90% of the titles look like they belong on Facebook instead of on a home game console, you really need to rethink your gaming platform. Thankfully the other 10% of the games are good, and there's some terrific console-exclusive titles. Since the Wii is cheaper than either of it's direct competitors, it's worth buying for the good games alone - but only if you have money to burn or if you don't already have an Xbox 360 or a PS3. The Nintendo Wii Classic Controller Pro was a great decision on the part of Nintendo. I'm all for these new ways of controlling games like the Nintendo Wii Remote and the Microsoft Kinect, and maybe one day we'll have advanced far enough to plug a cable into our temple and play the game in a dream world. In the mean time, however, some things just tend to work better with a normal controller. Whether that's because the games for the last few generations have been designed with the same basic controller types in mind, or whether we as gamers have just become accustomed to controlling games in a certain way, the end result is the same. Most of the Nintendo Wii titles are either cheesy casual games that only support the Wii Remote in a very basic way that would work equally well with a classic controller, or they're higher production games that throw in various motion controlled gimmicks to justify the new controller. Either way, I find myself letting my Wii collect dust because the Wii Remote just doesn't offer many distinct advantages over the regular controllers of other consoles. Even when it does manage to get something right, it's either not quite accurate enough to make it worth bothering or suffers from just enough latency to make it useless. The most use my Wii Remote gets these days is to browse around on Netflix. I still try out games here and there that require the Wii remote, but I almost always rent them before I buy them to see if it's worth attempting to play with a ridiculous control scheme. I keep buying a game here and there that specifically says it works with the Classic Controller, and most of those games have been decent... but many are virtual console games that were previously released for the earlier Nintendo game consoles or the Sega Genesis. 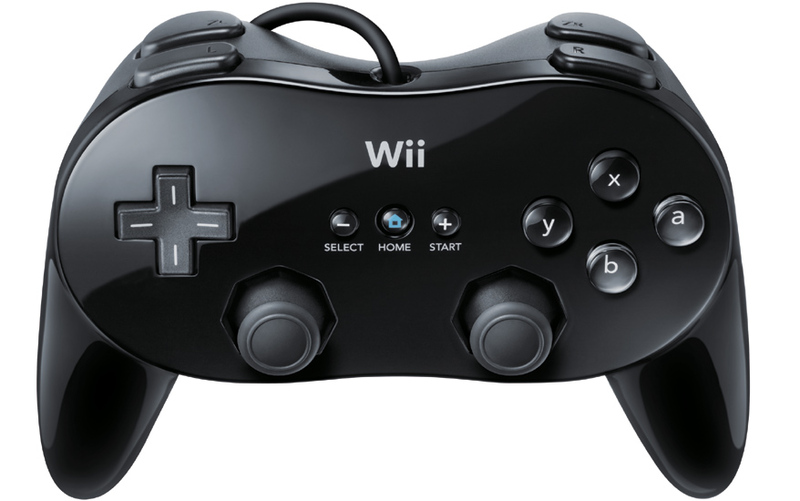 The Nintendo Wii Classic Controller Pro looks and operates similarly to any other current generation console controller. It features a directional pad on the left and four digital buttons on the right in a diamond pattern similar to a SNES (Super Nintendo Entertainment System) or Playstation controller that are labeled X, Y, A and B. It also features two analog control sticks at the bottom of the controller, and these are spaced out similarly to a Playstation controller. The original Wii Classic Controller also had two analog sticks, but they were closer together and uncomfortable to use. The original Wii Classic Controller also had L and R shoulder buttons, as well as ZL and ZR buttons beside them placed closer to the center of the controller top. The Classic Controller Pro moved these ZL and ZR buttons underneath the L and R to form two rows of shoulder buttons like all the other current generation controllers have. This makes it easier and more convenient to play multi-platform games that were also released on one of the Playstation or Xbox consoles. The power cord on the original Classic Controller stuck out of the bottom of the controller instead of the top. I really never liked this, and it's one of the things I always hated about the Sega Dreamcast controller. Thankfully the Classic Controller Pro fixed this problem as well by making the cord come out the top of the controller. This controller is also comparable in size to a standard Playstation or Xbox controller, where as the original Classic Controller was flatter and lacked the ergonomic handles/grips/wings of the Classic Controller Pro. It is a little lighter than the Sony or Microsoft competitors, but it's light weight does not come at the expense of durability or make it feel cheap. The Classic Controller Pro isn't wireless, but it's the next best thing. 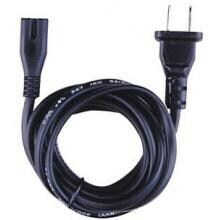 The three foot cord that comes out the top plugs directly into the bottom of your Wii Remote just like the Nunchuck, which at least allows you to sit across the room without stretching a cord across the floor for people to trip on. My only problem has been accidentally standing up, forgetting the Wii Remote was in the chair next to me and leaving it dangling in the air by the cord while I was holding the Classic Controller Pro. Oops. Sadly, most Nintendo Wii games do not support the Wii Classic Controller Pro. All Virtual Console games support it, as well as some WiiWare titles. Thankfully a few of the Role Playing Games on the Wii support it, which was my main concern. Arc Rise Fantasia, Final Fantasy Fables: Chocobo's Dungeon, Fire Emblem: Radiant Dawn, Monster Hunter Tri, Rune Factory Frontier, Tales of Graces, Valhalla Knights: Eldar Saga... all good to go. While RPGs may seems an obvious choice for Classic Controller support, there are other genres represented by titles such as Call of Duty: Black Ops, Madden 12, Need for Speed: Undercover, Samurai Warriors 3, Super Smash Bros. Brawl and WWE All Stars. Unfortunately the Classic Controller Pro does not work at all with Nintendo GameCube titles, so if you were thinking of picking one up to play through your GameCube library semi-wirelessly, think again. I love the Nintendo Wii Classic Controller Pro, I only wish it supported more titles. Not liking the gimmicky motion-sensitive Wii Remote nearly as much as I initially thought I might, I'm thankful that Nintendo came out with a decent classic controller with a familiar design and layout so that I can play as many titles as possible with it instead. If you have a Nintendo Wii and don't care for the Wii Remote, or if you plan on playing a lot of Virtual Console titles, definitely pick up a Nintendo Wii Classic Controller Pro. If you don't use the Virtual Console much, make sure to check your games for Classic Controller support before you waste your money. School Tycoon was developed by Cat Daddy games and published by Global Star Software, and it's just another face in the crowd of tycoon and simulation games. It's a few years old now, but even in it's heyday it didn't bring anything original or new to the table. That is not to say that it's a bad game either, it simply fails to differentiate itself from the masses of other games in the genre. These days it can be had for a couple dollars at places that sell used games and software. I had my copy given to me in a box of unsorted, pre-owned computer discs so I figured I'd give it a shot. There really is no story in School Tycoon. You become a school principal, and for some reason this puts you in charge of building the whole school from the ground up. That's really all there is to it. The whole game game revolves around you creating and running a school. You can do this in an infinite sandbox mode, or complete a series of 24 challenges. These challenges are separated into 8 beginner, 8 intermediate and 8 difficult challenges. The challenges are varied, and all have some sort of time limit in which you must complete them. You can continue playing that particular map in a sandbox mode after the challenge is complete if you wish. Beginner challenges are obviously easy. In one you will have to acquire 20 enrolled students and hire a teacher for each building, and in another you need to get student morale up to 75%. One challenge in particular, "Fitness Fanatic" requires you to obtain a 70% athletic rating and a 60% academic rating. When I started it, all I did was throw a fountain in the middle of the map and hire a couple teachers, and I randomly won in the first 2 minutes before I even started looking at what I was going to need to work on first. The intermediate challenges are a bit tougher, for example enrolling 40 students and obtaining a 2 Star Rating out of 5 for your school, or keeping your facility conditions up to 90% while retaining at least 60 enrolled students. The difficult challenges are the hardest; one requires you to maintain a 95% athletic rating, 95% academic rating, and 95% facility conditions. Another requires you to earn $100,000 in 4 weeks, which often times involves playing right and then mass selling all of your buildings at the last minute to push yourself over the mark. Completing all the challenges does... well, nothing. You can try them again, or play the sandbox mode instead. The sandbox mode allows you to start from scratch on a fresh map. You can choose to start on farmland, at the beach or in the city. You choose which buildings you wish to place, what staff members you wish to hire, and try to successfully manage your school. You need to make sure your students maintain good grades to keep your academic rating high and do well at sports to keep your athletic rating high. You also must have landscaping, janitorial and maintenance buildings along with their staff to ensure your school stays in good working order and stays clean. The game is pretty easy for the most part, but as you get better and better it gets hard to keep up. I constantly find myself running out of money and going bankrupt for one reason or another, even if I was doing really well just a few minutes before. Natural disasters like tornadoes and earthquakes are the biggest factor in this, and they tend to happen way too frequently later in the game. If you go into the negative balance for 3 days, you go bankrupt and it's a game over. This can make the game pretty challenging sometimes -- but only in the annoying random way that no amount of playing better can fix. There's a school newspaper that you can click on at the bottom of the screen that gives you some vague indication of how well the students think you are doing. Periodically there are also "coupons" in the paper that, while expensive, are really helpful if you can afford them. They allow you to have things such as parent-teacher conferences, pep rallies or science fairs. These events increase your academic, athletic or morale when you have them so the coupons can really help. You have a report card in the bottom right corner of your screen where your school is judged on various criteria. These include academics, athletics, morale, discipline, as well as an overall rating. You get graded from A to F just like in school. In addition to the grade, your school is rated on a scale of 1 to 5 stars at the top of the screen. If you want to get a 5 star school, you're going to want to build every building, staff them with good teachers and coaches, and try to keep an A grade in every category on your report card. You can click on individual students or staff members to see more details about them. For students, you can check on their progress in academics, physical fitness, obedience and happiness. You can also give each student individual commands, telling them to go to the nurse, detention, expelling them or telling them to goof off. It also tells you if they are healthy or not. Another tab tells you their general proficiency in athletics, their IQ, how friendly they are, whether they're good looking and how rowdy or clumsy they are. The last tab is for students and staff alike, and it tells you their general comments. A student may say something like "Dude, there's nothing fun to do around here." or "My teacher is really cool!". Teachers may say "Someone control these students!" if the students in her classroom aren't well disciplined, or "Does no one like my class?" if her classroom is relatively empty. This is handy, because when students leave the school they get red exclamation points over their heads. If you click on one, and his comment says "If I stay here I'll starve to death! ", then you know you probably need to place more food buildings. A number of comments are stored, and there are up/down buttons at the bottom of the comment tab to scroll through them. For academic buildings, you can only build portable versions of some of the classrooms. These include a library, English, math, social studies and biology buildings. They are basic classrooms that can teach a limited amount of students and only improve your academic rating a small amount, but they're very cheap and each different one you build will increase your school's rating to an extent. As you build, you unlock the portable versions of chemistry, computer, workshop, art and music classrooms that cost a hair more and improve your academic rating a hair more. They still only hold a limited amount of students though. After building the portable versions of different classrooms, the medium versions are unlocked. They cost a lot more, can support more students at once and raise your academic score by an even larger amount. After the medium versions come the deluxe versions of the same buildings. They are far beyond the medium classrooms, supporting the largest number of students and raising your academic rating by the largest amount. They're pretty expensive, but worth it -- especially in a sandbox game where you're not being timed and can more easily spend enough time to collect the money to build and staff them all. To balance out the students' academic needs, you also need to address their physical fitness. You can build a gymnasium from the start and it produces a pretty decent boost right from the get go. As you progress into the game you can augment your athletics rating by building a sports field, tennis courts, baseball fields, basketball gym, large tennis courts and football fields. The football field is the penultimate sports building, boosting your athletics rating by quite a bit and also supplying a morale boost to your students by having a school football team. The large tennis court is probably the most efficient because it holds a lot of students and also boosts your athletics rating by a large number. However, it doesn't provide the morale bonus of the football field. Another important thing to consider is the basic upkeep of your school. A small janitor's office lets you hire 2 janitors to keep your school campus clean. Without janitors, trash builds up on your pathways. Students aren't happy walking through trash for some reason, so they'll start leaving your school if it gets too bad. You can upgrade to a medium janitor's office that houses 4 janitors, and there's a deluxe janitor's office later that is quite expensive and I haven't had the need to ever purchase at all. Maintenance buildings are also important, as your other buildings will fall into disrepair, catch fire and burn to the ground. There's no way to put out a fire once it starts, you just have to wait it out and then rebuild a new building where the old one stood. For that reason alone it's important to have at least a small maintenance building. Like the janitor's offices however, through all the challenges and a few hours of sandbox mode, I've never had to build more than one small maintenance building in the entire game. Small, medium and deluxe nurse's offices requires no teachers or staff. They tend to injured students and boost student morale. The medium and deluxe versions can tend to more students at once and provide a bigger morale bonus. Detention centers are another helpful building that boost your student's discipline. Without one, students get expelled from your school occasionally. With one, they get sent there to try and fix their problem first. The medium and deluxe detention centers can help solve more discipline problems to keep more of the students at your school instead of being expelled. The last maintenance buildings are the teacher's lounge and the landscaping office. There are 2 teacher's lounges, the medium and large versions. They help keep your teachers happy so they don't demand extra salary. There's only one landscaping office, and it's useful for keeping your lawns, trees and bushes clean and maintained. Entertainment buildings don't need teachers or staff, and they hold a decent amount of students. They cost a bit, but they raise student morale at the school. You can build an arcade, small and regular half-pipes, a mini golf course, a go-cart track and a roller coaster. Students will sometimes leave the school because they're hungry, and food buildings are the remedy. There are 2 different candy machines and 2 different soda machines, but they don't seem to help much. The more useful buildings are the classic cafe, a pizzeria and a burger joint. The burger joint costs the most, but provides a student morale boost as well. The last important building would be the restroom. There are portable toilets that allow hold one student at a time, but like the vending machines they don't seem to help much. You can unlock medium bathrooms fairly early that help out a lot, and later large bathrooms that are practically required because they hold a lot of students. You can also place various objects in addition to buildings. Trees and bushes make your school look better and students like them. A big fountain in the center of your school is a great boost to your reputation. Picnic tables (along with benches and chairs) give students a place to sit outside, which is especially useful near food buildings. Trash cans cut down the litter so your janitors aren't overworked. You can also lay down paths of different designs to act as your sidewalks, which helps guide students to the various buildings. There's also a semi-useless terrain tool that lets you place grass and flower beds and stuff, but it didn't seem to do anything for student morale. You must sell any buildings to get rid of them, but you can destroy any objects in the game for free with the clearing tool. Teachers are the most obvious and most important staff members. They earn the most money (along with coaches) of any of your staff, and you have to choose carefully. They have 3 statistics that are randomly generated on a scale of 0 to 10: fun, discipline and skill. Skill is by far the most important stat, as it allows them to teach better and garner you more academic rating. Putting highly skilled teachers in deluxe classrooms where they can teach the most students is a sure fire way to make your academic rating skyrocket. A teacher's discipline rating boosts your students' discipline and makes them less likely to be expelled. You can skimp out on the stat though, as building discipline centers will accomplish the same thing and they only have to be built once, where teachers must be paid salary. The same holds true for the fun stat, it keeps students happy with a morale boost -- but the various entertainment buildings will accomplish that goal. Teachers with higher stats tend to want more money, so balancing them is key. Coaches are a close second and work in the same manner as teachers do, except that they go to athletic buildings instead of academic ones. You need a teacher for each academic building for the building to be useful, and a coach for each athletic building. Cooks work in the cafes, pizzerias and burger joints. If your cook isn't very skilled, your students can get food poisoning. I was a few hours into a sandbox game where I skimped out and used a low skilled cook, then my students got food poisoning and half of them left so I went bankrupt. Don't be too stingy! If you don't like the stats on any of the staff, you can close the menu and when you open it back up all the staff will have changed and had their stats randomized. Take advantage of this to get people you can afford with stats around what you're looking for. Janitors, maintenance workers and landscapers require less salary and have no stats. Janitors are the most important, because they are the only way you can clean up the trash on the ground, and ground litter delivers a big hit to student morale. Maintenance is next, as they keep your buildings, vending machines, etc. in good repair. They're most important during natural disasters such as earthquakes or tornadoes where multiple buildings take damage and need repaired before they catch fire. Landscapers are least important, usually 1 or 2 is plenty for the whole game. They keep the grass cut and take care of statues, fountains, etc. to help with morale. At the beginning of the game there's a quirky little animated sequence about a school principal who's fed up with managing the school and leaves the job to you. It's pretty neat, and the voice work was spot on. Unfortunately, it's the only place that had any voice work. There's also no background music in this game, leaving it a little lax in the audio department. The sound effects were decent and fitting, but forgettable. A bubbling sound when you click on the chemistry lab, cash register sound when you click on the cafeteria, toilet flushing sound when you click on the restroom, lots of school bells all around, etc. The game is presented in an overhead isometric view. The graphics are nice looking and cartoony, but nothing spectacular. They are reasonably clear, but some buildings I have trouble telling apart unless I click on them and read what it is. When you click on a building you can see a small square at the bottom right of the screen that shows you a 3D peek inside the building (except for the bathroom). If you click the full-screen icon at the corner of that little square, it takes you inside the building full-screen where you can look at the occupants and click on each person inside to see what they're thinking. There are 3 different camera views of the inside that you can toggle with an on-screen button. I think the inside view looks better than the main part of the game. Most of the game functions such as hiring staff or building classrooms is done from drop-down selection menus in an icon bar at the top of the screen, and the menus are easy enough to read and operate. I just wish there were more tool-tips to explain the individual bonuses each building gives in greater detail. You can scroll around by moving the mouse to the any edge of the screen. You can also use the mouse wheel to zoom all the way in to an individual student, or all the way out for an overview of the whole school. School Tycoon is a decent game, it just doesn't stand out from the crowd of other tycoon and simulation games on the market. Since it's a bit of an older game you can usually find it for next to nothing, but unfortunately that's about all it's worth anyway. While not bad, it's merely an average game, so I'd say pass on this one and pick up Transport Tycoon, RollerCoaster Tycoon, Theme Hospital or any of the Sim City games instead.